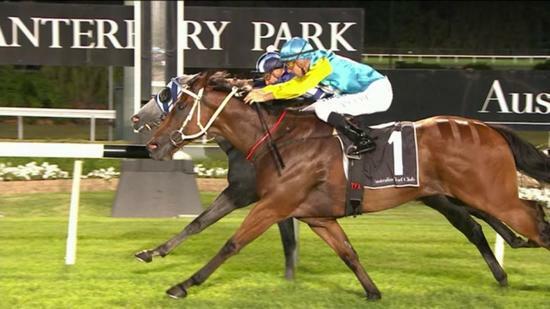 Close finishes are the pattern of Viceroy's performances at Canterbury and tonight's finish was typical. Having settled well behind the leaders in running, Viceroy was poised to challenge on the turn. However, Tye Angland had horses all around him and as he sought to manoeuvre Viceroy into clear running space, Spending To Win shifted ground and Tye had to come across its heels to get clear. When clear, Viceroy put his head down and ate up the ground rapidly, but he failed by a nose to overtake Spending To Win. On returning to scale, Tye lodged a protest against Spending To Win being declared the winner. The stewards reviewed the race film and listened to evidence from both riders and trainers. After a short deliberation, the stewards upheld Tye's objection and declared Viceroy the winner. This gave Viceroy three wins from four starts at Canterbury and all have been in very close photo-finishes and all over 1,100 metres. Since joining Pepper Racing, Viceroy has had nine starts for four wins, one second and one third and eight of those starts have been on Sydney metropolitan courses. Luke has placed him to perfection and and his prizemoney in these nine starts of just under $107,000 is a very nice reward for Viceroy's owners. Congratulation to Luke and the owners and may Viceroy continue to keep his nose in front. Hoofnote: In the Pepper Racing February Newsletter issued yesterday, Luke's success at the William Inglis Classic sales was mentioned with Zuccherina being one of his more successful purchases. Well, Zuccherina duly won her tenth race at Port Macquarie this afternoon. Luke will certainly be looking to purchase qood-quality yearlings at value-for-money prices. If you are interested in being a part owner of one of his purchases, contact Luke directly on 0421 960 124.